As you might imagine, I love games that enhance literacy! 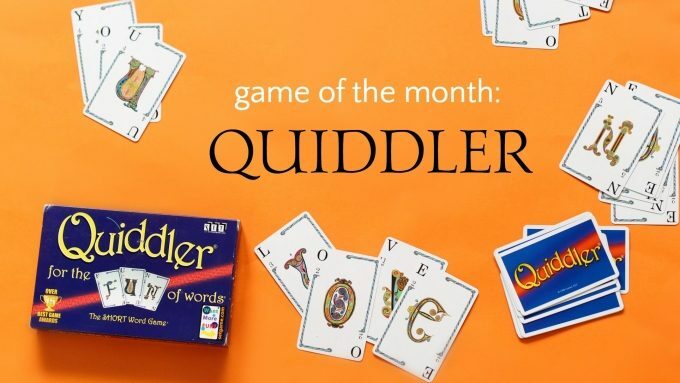 Quiddler, a card game in which the objective is to spell words, is one such game, and it’s my Game of the Month selection (which I am getting in just under the wire)! As usual, I won’t be including the full rules to Quiddler, because of course you will read them when you open up the Quiddler deck of cards! However, here is a overview of how to play Quiddler so you can decide if it works for your family (which I think it will). Think of Quiddler as Scrabble, but without the crossword part. Objective: To be the first arrange all the cards in your hand into words ranging from 3-10 letters. Words all have a point value and the player with the highest score wins. Variations: The standard game is played with 2-8 players, but the instructions include rules for a solitaire game, which gives you more bang for your buck! 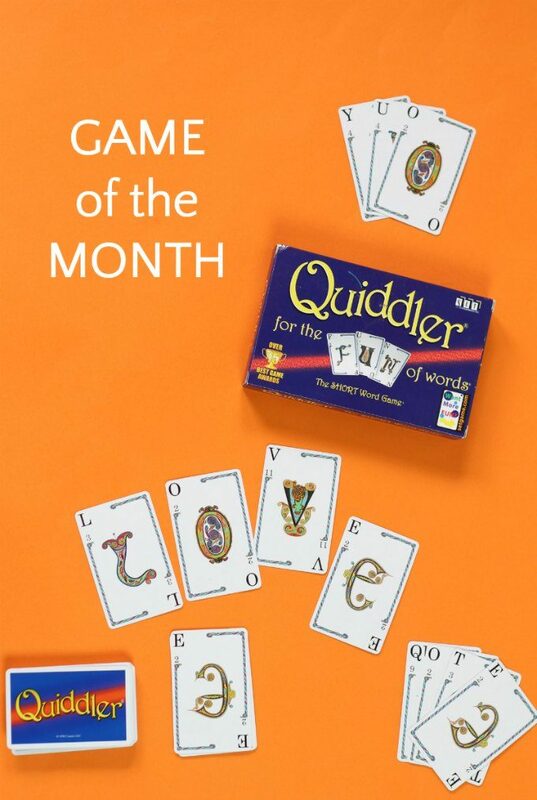 Fun fact: The folks who make Quiddler also make SET, a game of visual perception that we also featured as a game of the month! Even if you haven’t had success with games like Scrabble, Quiddler offers a good alternative with it’s own challenges but without the potentially stressful situation of the crossword format. 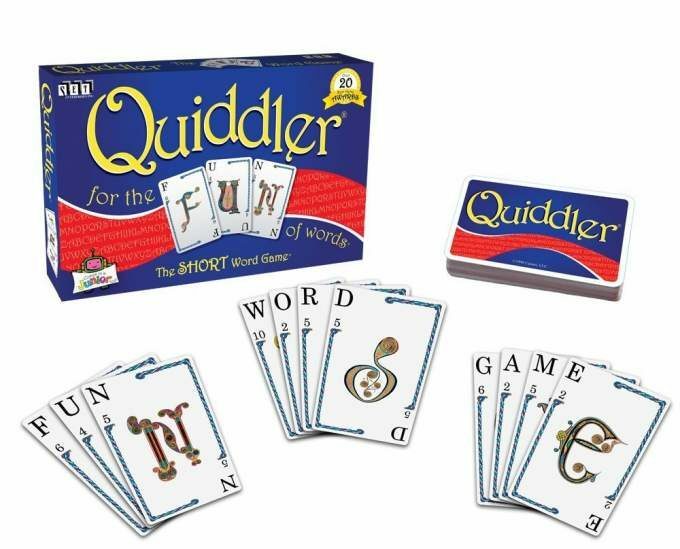 Quiddler is a fun way for kids to practice their spelling skills in a relaxed, family setting (or on their own if they are playing the solitaire version). This is not a “kids game.” Adults will enjoy playing alongside their children. The game is recommended for ages 8 and up. I recommend teaming up a younger child with an adult in order to include the whole family (okay, it’s not a game for toddlers). Children who are just beginning to read will enjoy finding letters in their adult’s hand, and younger readers will feel proud when they find a word with the help of their grown-up teammate. Grown-up players might put together unfamiliar words; this is a great vocabulary learning experience for kids, especially if you keep a dictionary at the table while you play. « Diverse Back to School Books to Help Everyone Feel Welcome! We love Quiddler! My 9 year old plays on her own and I play on a team with my 6 year old. We have Quiddler Jr… the only difference may be some kid-friendly illustrations on the card, I’m not sure. Though per the rules, we end after a round of 7 letter words, so I guess there’s that small difference as well.